These muffins are delicious and reasonably healthy! Filled with wholemeal flour, oats and apples so that your kid’s will get plenty of energy from them to help them stay focused on their studies at school. You could even add in some sultanas or dates if you wanted for extra fibre and goodness! 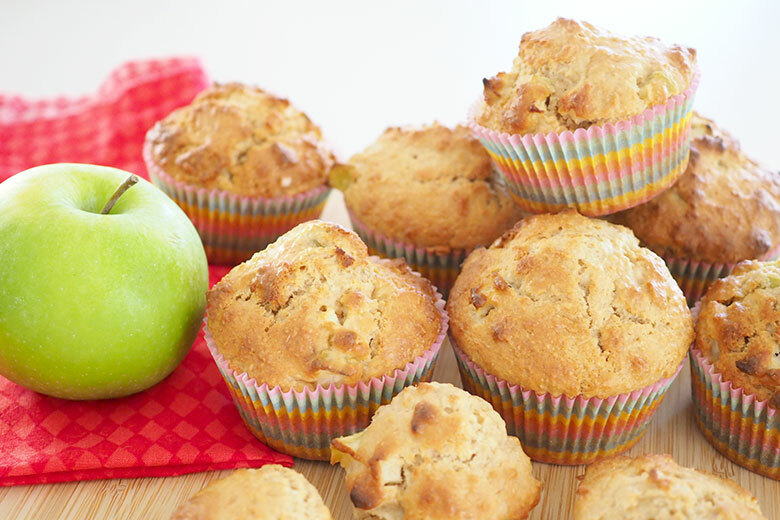 Apple muffins are my kid’s favourite, so I make all kinds of apple muffin recipes, but one thing I really like about this recipe is the amount of batter the recipe makes. 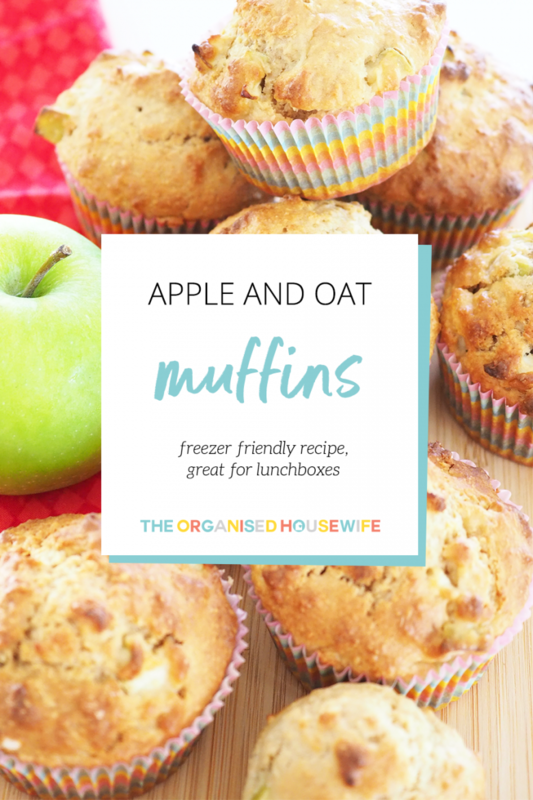 You get 12 regular muffins plus 12 mini muffins out of this recipe, which is so handy for school lunchboxes and after-school snacks. It makes enough for the kids to have some for afternoon tea and freeze for school and work lunch boxes. This is my lunch for work today: chicken salad, berries and 2 mini apple and oat muffins. 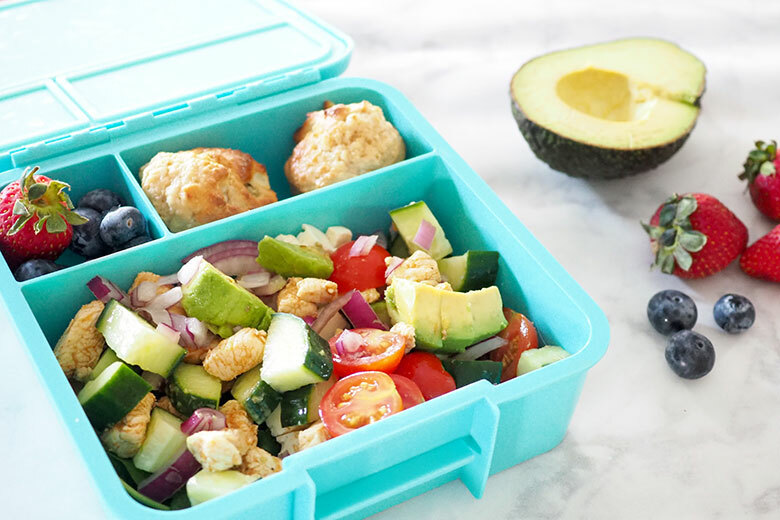 SHOP THIS LUNCHBOX: Available in my shop here. Preheat oven to 180°C, line a 12 hole regular muffin tin with patty cases and grease a 12 hole mini muffin tin. Combine oats and milk into a bowl, stand to soak for 10 minutes. Add maple syrup, egg, butter, sugar and vanilla extract to oat mixture, stir to combine. Add flour and apples, gently stir through. Spoon mixture evenly into prepared muffin tins. Cook mini muffins for 8-10 minutes or until a skewer comes out clean. Cook regular muffins for a further 5-8 minutes or until golden and cooked through. Allow to cool in pan for 5 minutes, then transfer to a wire rack to cool completely. For more lunchbox recipes to freeze, download my 50+ Freezer Friendly Lunchbox Recipes EBook. It’s great to serve the kids with healthy and nutritious snack. I will try this recipe. Thanks for sharing. Sounds yum, wondering if recipe would work with maple flavoured syrup (I don’t have any actual maple syrup in the pantry at the moment)? I don’t see why not Mariana, it just make be a little sweeter than with the real syrup. Hope you enjoy. I just made them with green maple flavoured syrup and they were fantastic! That’s great to hear that it can be used too Sarah, thank you for sharing, so pleased you enjoyed them! Any chance you could put up the recipes in grams or lbs and oz????? Please!! I made these today to add to our lunch boxes this week. I did play around a bit and did not use maple syrup or the sugar but rather added Rice Malt Syrup (reducing sugar intake.) It is a lovely recipe and will add it to my “go to” recipe list. A hit for miss 7! Another fantastic recipe thanks for sharing Kat.